Shooting slump factor in three big losses for Culver Bulldogs boys basketball team. 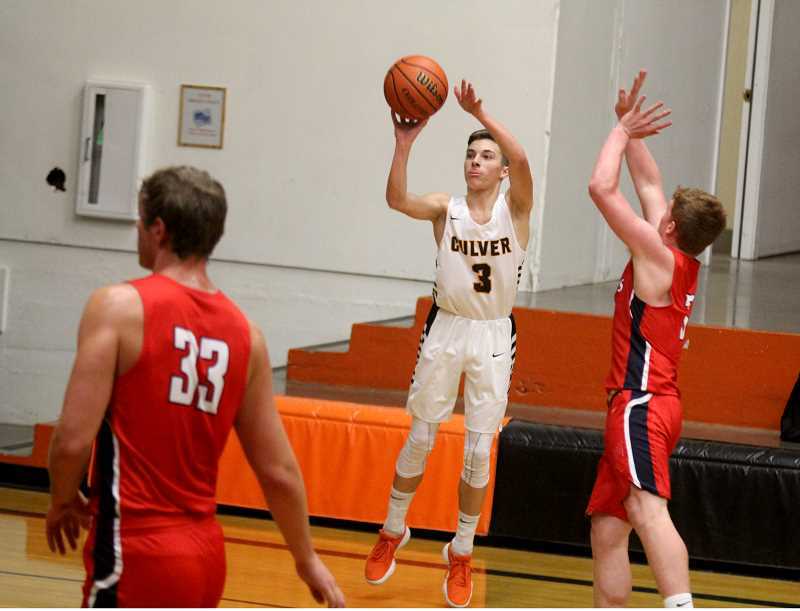 The Culver Bulldogs boys basketball squad went through a big shooting slump with three blowout losses this week. Culver lost to Kennedy 75-27 on Monday, Jan. 28, Santiam 57-16 Wednesday, and Colton 58-28 on Saturday. The Culver boys basketball team hung with the Colton Vikings for a while, but as the game continued, the Vikings kept extending their lead and came away with the 30-point win. Junior Cord Gomes has really been stepping up his game lately and he started off with a steal and a lay-in, giving Culver a 2-0 lead. Colton hit a mid-range jump shot, but it was answered by a 3-pointer by Luke Spinelli. On the next play, Spinelli drove hard to the hoop, stopped on a dime and hit a jump shot, giving the Bulldogs a 7-2 lead. Colton then went on a 15-0 run with a combination of threes, lay-ins and free throws. The Bulldogs went into the second quarter down 20-7. Spinelli scored the only Culver field goal in the second quarter on a putback, while Eli Tapia and Kobe Lamb were able to make some free throws, but Culver gave up 22 points in the second quarter and went into the locker room down 42-12. In the second half, especially the fourth quarter, the Bulldogs were hustling, diving for 50-50 balls and working their tails off. Culver outscored the Vikings 12-2 in the fourth quarter, with Gomes scoring 9 points in the final frame. Spinelli and Gomes both finished the game with 12 points and Gomes also added seven rebounds. Lamb also showed his presence of defense with four blocks. 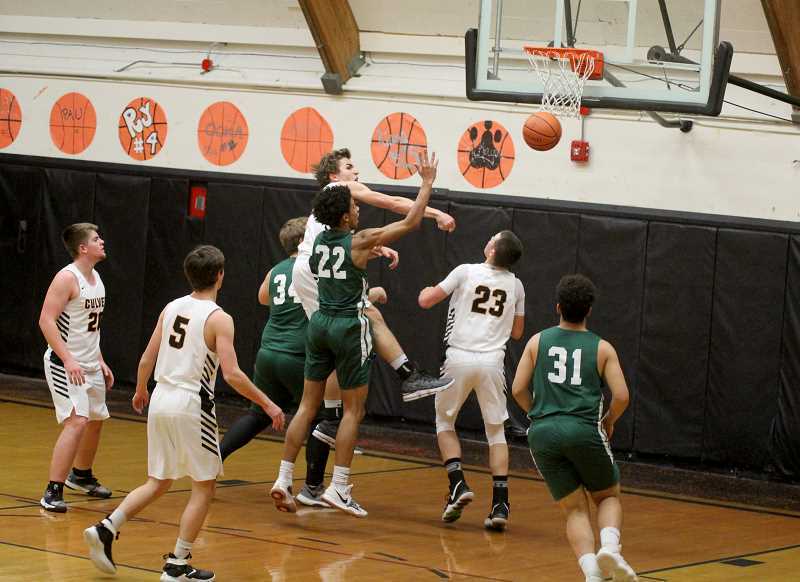 Culver was only able to score 16 points in their loss to Santiam, shooting a frigid 16 percent from the field. "We turned the ball over and when we were able to get good looks, we couldn't make anything," head coach Johnny Wilson said. "It was nonstop transition defense because we either turned the ball over or missed shots." One highlight for the Bulldogs, Lamb ended the night with seven blocks for Culver. The Bulldogs were able to hang with No. 8-ranked Kennedy in the first quarter, only down by eight, but went into halftime down 37-16. Culver put their second unit in for the fourth quarter and Kennedy outscored the Bulldogs 27-5. "A lot of the mistakes we made were just silly, little, careless stuff," Wilson said. "I got on them after the game, telling them how disappointing that was to finish that way." Spinelli led the team with 8 points and Gomes ended the game with 6 rebounds. "This was the beginning of a long, cold, three-game, shooting stretch," Wilson said. The Bulldogs have their senior night and last home game of the season against the No. 1-ranked Western Christian on Thursday at 4:30 p.m.